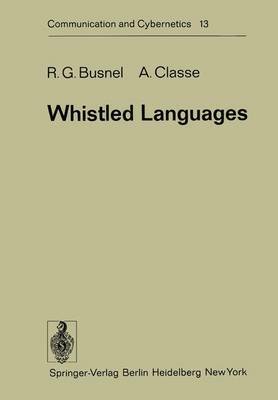 This monograph deals with curious and little-known acoustic systems of commun- ication based on whistling that are in use at the present time in many parts of the world and have had, on the evidence available, even greater currency in the past. In spite of their wide distribution, they have not so far received the attention they might have been expected to attract: linguistically and in other ways they are most interesting. For it should be realized that they are much more than mere codes or conventional systems of signals; they function in exactly the same way as speech (in the sense we normally use the term), being in fact rather extraordinary realizations of the languages spoken in the re- gions where they occur. They utilize the vocabulary, grammar and, in many cases to a large extent, the phonology of the local speech. However their phonetic system is profoundly modified acoustically and (in some cases less so) from the point of view of articulation, because the glottal tone of every- day communication, the "voice", is repl aced by a whistl e which carries the in- formation. The advantage of this procedure, from the point of view of the user, is a vastly increased range as well as, under certain circumstances, a degree of secrecy. It will be shown that whistled languages appear in two main, very different forms.